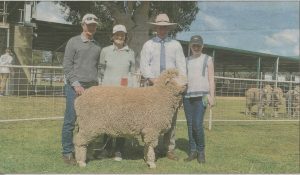 With continuing confidence in Poll Merinos, bidding was determined at the Woodpark Poll ram auction at Jerilderie on account Stephen and Carol Huggins when 140 rams were penned to see 135 sold at auction to average $2437. Top price of $8,000 was paid for a sheded ram, when 30 were sold for $3408, while $5,000 was top price paid for unsheded ram when 105 sold for average price $2160. A further seven flock rams were sold after the auction for $1500 average. Indicative of the strong interest in Poll Merino sheep, the sale was underpinned by many returning clients with new buyers also making their presence felt. 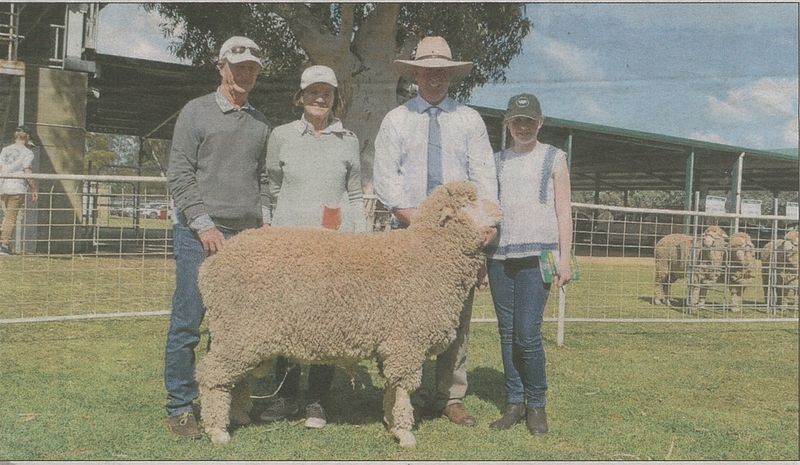 The top priced ram at $8,000, a AI son of the highly successful stud sire WP12-342, was bought by long term clients Donald and Ann Bull, “Mungarra”, Deniliquin. “He has good soft and crimpy wool on a bold and well structured body,” Mr Bull sad. Mr Bull and his family have been buying Woodpark-bred rams from the time his father purchased sheep from Stephen Huggins’ grandfather, the late Eric Huggins. The fleece of the ram measured 18.8 microns, with 3.1 SD and he was in the top 10 percent on Merino Select for Dual Purpose Index. Mr Bull was assisted in his purchase by Clyde McKenzie, Elders Deniliquin manager who advises Mr Bull on his ewe classing. “He is a very well balanced sheep with bright, waxy and crimpy wool,” Mr McKenzie said. 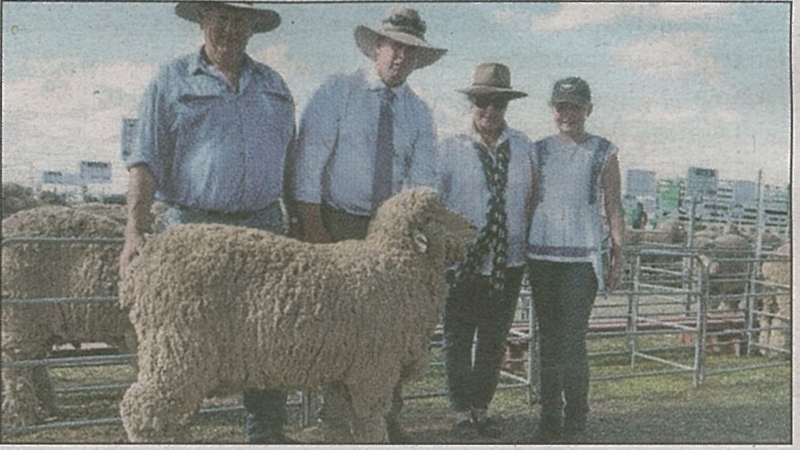 Also coming out of the sheded draft was the $5,000 ram purchased by Wagga Wagga-based sheep breeding consultant Craig Wilson for the Glasson family, Jimenbuen Past Co, Dalgety. 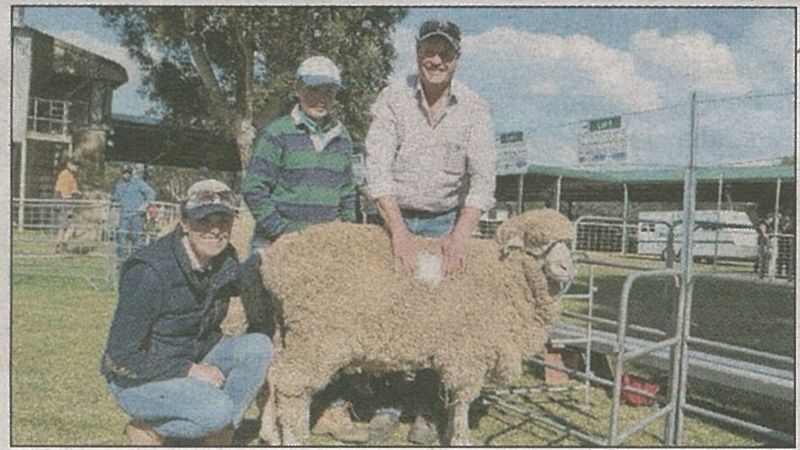 Sarah Houston (sister of Jack Glasson, Jimenbuen Pastoral Co, buyer of this ram) and Tom and Craig Wilson, Wagga Wagga with the $5000 purchase. Sired by WP 14-204 who had been joined to hand-picked elite ewes, will also be used in the ram breeding project for the self-replacing flock on “Jimenbuen”. “We are aiming for high performance using high index rams through AI, and this ram will be utilized as a back-up,” Mr Wilson said. “He was a trait leader for yearling clean fleece weight and has a good balance of the other figures like yearling weight, eye muscle and is moderate for fat. 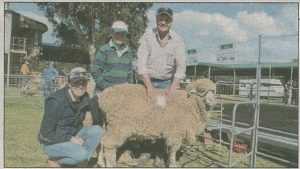 Mr Wilson also bought two further rams at $3,000 and $2,500 for the Jimenbuen Pastoral Co.
Coming south for their first foray into the Woodpark Poll offering, Dougal McLeish and his wife Susan Ainge, Thurn Merinos, Coonamble, purchased the top priced ram at $5,000 in the unsheded offering, along with one sheded ram for $4,250. Dougal McLeish, Stephen Huggins, Susan Ainge and Lily Huggins with their $5000 purchase made by Dougal and Susan for their Coonamble-district property. The McLeish family have been breeding Merino sheep for over 80 years at “Thurn”, and have changed to Poll Merinos three years ago for ease of management but still retaining the essential attributes of heavy cutting fleeces on a sound body. “We like the fact Woodpark have been breeding Poll for a long time,” Susan Ainge said when speaking on behalf of her husband. “They are true to type, with nice well-defined crimp and bright wool. The ram, with micron 16.6 and 2.8 SD will be used in Thurn Merinos’ self-replacing Merino flock to bred new sires. Also paying $5,000 were D.J. Boland and J.L. Peavey, Giffard, Victoria who selected the son of WP14-102. 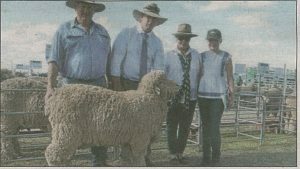 Significant prices included $4,500 paid by Grassy Creek Merinos for a ram with micron measurement 17.6 and in the top ten percent for Merino Select Dual Purpose Index: and $4,250 paid by Coghill Farming, “Dewhurst”, Urana for a young sire who was also in the top ten percent Merino Select for Dual Purpose Index. Volume buyers included Budgewah Pastoral Co, Hay who bought 16 rams to top $3,500, J.C. and L.M. Clark, “Merriola”, who paid to $3,000, twice in their selection of nine rams and MV Ag, Alectown who paid to $4,500 in their draft of eight rams. Stephen Huggins thought the prices paid reflected the genetic and structural depth of the sheep, but also the present values paid for sheep and wool. “It was a great sale and it is wonderful to see everyone rewarded for years of hard work,” he said. The sale was conducted by Elders, Jerilderie and Landmark, Finley, with Ron Rutledge, Peter Godbolt and Nick Gray taking the bids.